I have to admit that just at the moment I am feeling reasonably content with how the garden is shaping up. It is 5 years old and required its first major “chop” just as this spring began. The Euphorbia mellifera had become an enormous ball of bright green foliage. Attractive as it was it was crowding its neighbours out and so it was cut back to about 12″ above the ground, from where it is now sprouting nicely. The space it has created is now home to Verbena bonariensis and the Solanum lacinatum purchased last week. Pittosporum tobira “Nanum” was becoming less “Nanum” and more “Gigantium” and the demise of the Geranium maderense meant there were a few gaps to fill. I have planted new Geranium maderense in the shelter of a tree, but if they do not survive the next winter I am giving up with them entirely. 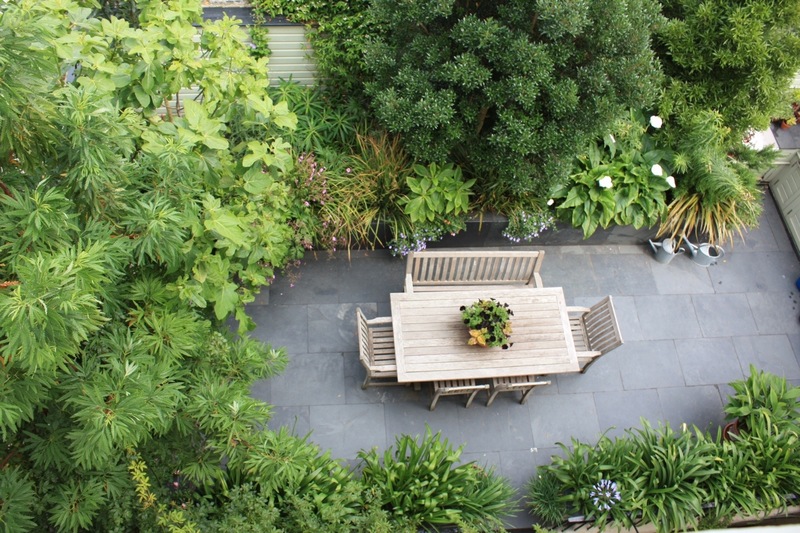 The height of the house means we get to enjoy an aerial view of our tiny plot, which helps with planning and placing new plants. It also affords us a lovely view out to sea. As you can see from the photo above, taken yesterday, the borders are once again full to bursting and the trees are starting to mature. They are nearly all as big as we want them to get, so will require some judicious pruning to keep them from overshadowing the terrace. After much adjustment it is genuinely becoming a garden for all seasons. When we started out the number of evergreen plants meant it could look a little samey. The dominant colour has always been green, but we have worked hard to introduce pops of colour for each season – bright tulips in spring and colourful annual climbers in summer. Late summer and autumn has always been more of a struggle, especially once the Agapanthus go over. This year I have Canna ‘Wyoming’, Gladiolus callianthus and Hedychium densiflorum ‘Stephen’ lined up to continue the show. In winter it’s time to just enjoy the architectural shapes of the structural planting, and the beautiful cinnamon coloured bark of Lyonothamnus floribundus asplenifolius, the Catalina Ironwood tree (see far left of the image above). 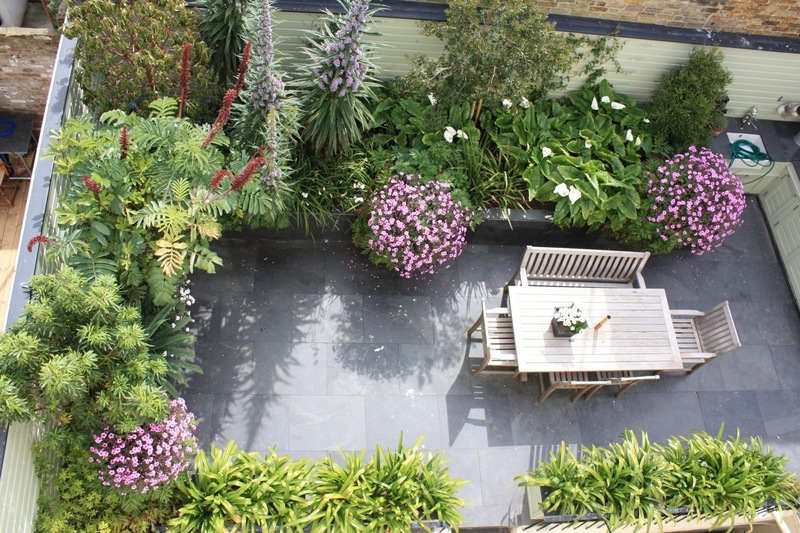 Compared to the photograph below, taken a year after planting, the garden has already come a long way. It will be interesting to see what the next five years brings and I hope it’s as much fun as the first.